In August 1955, Gorbachev started work at the Stavropol regional procurator's office, but disliked the job and used his contacts to get a transfer to work for Komsomol, becoming deputy director of Komsomol's agitation and propaganda department for that region. In this position, he visited villages in the area and tried to improve the lives of their inhabitants; he established a discussion circle in Gorkaya Balka village to help its peasant residents gain social contacts. 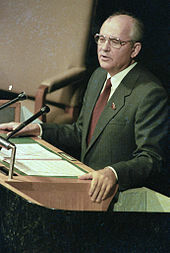 Although the 19th Party Conference was not scheduled until 1991, Gorbachev brought it forward to June 1988. He hoped that by allowing a broader range of people to attend than at previous conferences, he would gain additional support for his reforms. 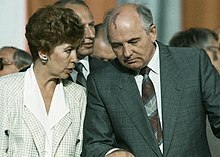 With sympathetic officials and academics, Gorbachev drafted plans for reforms that would shift power away from the Politburo and towards the soviets. While the soviets had become largely powerless bodies that rubber-stamped Politburo policies, he wanted them to become year-round legislatures. He proposed the formation of a new institution, the Congress of People's Deputies, whose members were to be elected in a largely free vote. This Congress would in turn elect a USSR Supreme Soviet, which would do most of the legislating. 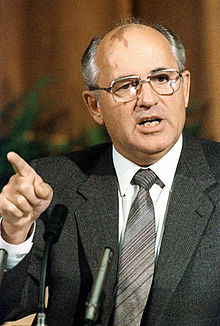 Following the failures of earlier talks with the U.S., in February 1987, Gorbachev held a conference in Moscow, titled "For a World without Nuclear Weapons, for Mankind's Survival", which was attended by various international celebrities and politicians. By publicly pushing for nuclear disarmament, Gorbachev sought to give the Soviet Union the moral high ground and weaken the West's self-perception of moral superiority. Aware that Reagan would not budge on SDI, Gorbachev focused on reducing "Intermediate-Range Nuclear Forces", to which Reagan was receptive. In April 1987, Gorbachev discussed the issue with U.S. Secretary of State George P. Shultz in Moscow; he agreed to eliminate the Soviets' SS-23 rockets and allow U.S. inspectors to visit Soviet military facilities to ensure compliance. There was hostility to such compromises from the Soviet military, but following the May 1987 Mathias Rust incident—in which a West German teenager was able to fly undetected from Finland and land in Red Square—Gorbachev fired many senior military figures for incompetence. 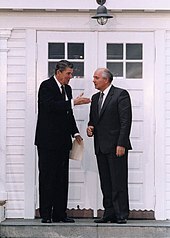 In December 1987, Gorbachev visited Washington D.C., where he and Reagan signed the Intermediate-Range Nuclear Forces Treaty. Taubman called it "one of the highest points of Gorbachev's career". 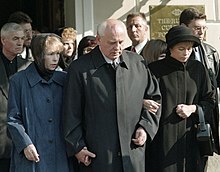 Since studying at university, Gorbachev considered himself an intellectual; Doder and Branson thought that "his intellectualism was slightly self-conscious", noting that unlike most Russian intelligentsia, Gorbachev was not closely connected "to the world of science, culture, the arts, or education". When living in Stavropol he and his wife collected hundreds of books. Among his favourite authors were Arthur Miller, Dostoevsky, and Chingiz Aitmatov, while he also enjoyed reading detective fiction. He enjoyed walking as a hobby, and had a love of natural environments. He favoured small gatherings where the assembled discussed topics like art and philosophy rather than the large, alcohol-fuelled parties common among Soviet officials. His favourite sport was association football. 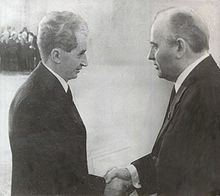 For many of the Communist Party nomenklatura, the dissolution of the Soviet Union was instead seen as a disaster as it resulted in their loss of power. While in office, many of his Communist Party critics thought his reforms were reckless and threatened the survival of Soviet socialism. In Russia, he is widely despised for his role in the collapse of the Soviet Union and the ensuing economic collapse. General Varennikov, one of those who orchestrated the 1991 coup attempt against Gorbachev, for instance called him "a renegade and traitor to your own people". Many of his critics attacked him for allowing the Marxist-Leninist governments across Eastern Europe to fall, and for allowing a reunited Germany to join NATO, something they deem to be contrary to Russia's national interest. During his career, Gorbachev attracted the admiration of some colleagues, but others came to hate him. Many Russians saw his emphasis on persuasion rather than force as a sign of weakness. In 1988, India awarded Gorbachev the Indira Gandhi Prize for Peace, Disarmament and Development; in 1990 he was given the Nobel Peace Prize for "his leading role in the peace process which today characterizes important parts of the international community". Out of office he continued to receive honours. In 1992 he was the first recipient of the Ronald Reagan Freedom Award, and in 1994 was given the Grawemeyer Award by the University of Louisville, Kentucky. In 1995 he was awarded the Grand-Cross of the Order of Liberty by Portuguese President Mário Soares, and in 1998 the Freedom Award from the National Civil Rights Museum in Memphis, Tennessee. In 2002, Gorbachev received the Freedom of the City of Dublin from Dublin City Council. In 2002, Gorbachev was awarded the Charles V Prize by the European Academy of Yuste Foundation. 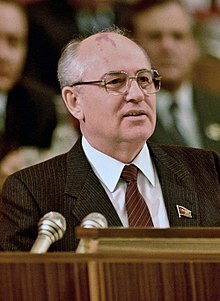 Gorbachev, together with Bill Clinton and Sophia Loren, were awarded the 2004 Grammy Award for Best Spoken Word Album for Children for their recording of Sergei Prokofiev's Peter and the Wolf for Pentatone. 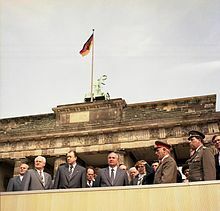 In 2005, Gorbachev was awarded the Point Alpha Prize for his role in supporting German reunification. He also received an honorary doctorate from the University of Münster. ^ Doder & Branson 1990, pp. 192–193, 324; McCauley 1998, pp. 94–95; Taubman 2017, p. 351. ^ Doder & Branson 1990, p. 336; Taubman 2017, p. 353. ^ Doder & Branson 1990, p. 371; McCauley 1998, p. 143; Taubman 2017, pp. 475–476. ^ Doder & Branson 1990, p. 364; Taubman 2017, pp. 478–479. ^ Doder & Branson 1990, pp. 284–285; McCauley 1998, p. 138; Taubman 2017, pp. 401–403. ^ Doder & Branson 1990, p. 318; Taubman 2017, pp. 411, 413. ^ Doder & Branson 1990, p. 320; Taubman 2017, pp. 416–417. ^ Doder & Branson 1990, pp. 356–357; McCauley 1998, p. 139; Taubman 2017, pp. 421–422. ^ Doder & Branson 1990, p. 352; McCauley 1998, p. 139; Taubman 2017, pp. 422–426. ^ Doder & Branson 1990, p. 347. ^ Doder & Branson 1990, p. 324. ^ Doder & Branson 1990, p. 366. Dmitry Timofeyevich Yazov was the last Marshal of the Soviet Union to be appointed before the fall of the Soviet Union. 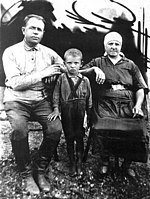 He was the only Marshal of the Soviet Union to be born in Siberia. 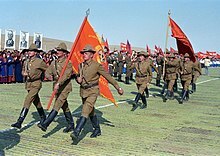 A veteran of the Great Patriotic War, Yazov is the last surviving Soviet Marshal and the only military marshal not to have been awarded the title Hero of the Soviet Union. Mikhail Sergeyevich Solomentsev was a high-ranking Soviet politician. He was born near Yelets and graduated from the Leningrad Technological Institute in 1940. 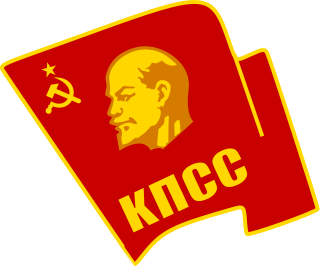 Solomentsev was a leading Communist party functionary in Kazakhstan during 1962–1964 and was in charge of the Rostov-on-Don obkom from 1964–1966. 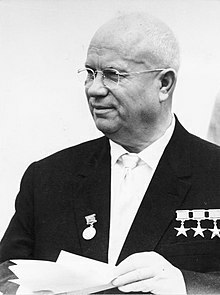 He served as a secretary of the Central Committee of the Communist Party of the Soviet Union during the years 1966–1971. Solomontsev was Chairman of the Council of Ministers of the Russian RSFR starting from 1971 and ending in 1983. He sat in the Politburo from 1983 until he was sacked by Mikhail Gorbachev five years later.